Un doigt d’honneur aux censeurs mais le problème, c'est que c'est très mauvais. Although it sports a smidgen more class than Cohen's previous efforts. Bruno is backward, insulting, disgusting, degrading and spends far too much time focusing on making all the wrong points. Just like Borat, this is bottom of the barrel film making. This is silly fluff, and it knows it. The principal shortcoming is that the character of Brüno is just not as unique and striking as his predecessors, Ali G and Borat. It doesn't milk too many hapless celebrities, but it has a few funny moments when members of the American public (especially the pushy "Hollywood parents") are falling foul of Cohen's set-ups. The fully scripted scenes are largely worthless filler. I don't feel great about having watched this and laughed some. Jesus, the size of the balls on this man. It's near-perfect until the overlong end. I'm a fan of SBC and find him watchable even when he's not at his best. 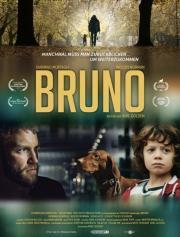 In Bruno, the spiritual sequel to the much funnier Borat, there are a few inspired scenes such as the Parent interviews but there's a lot that doesn't hit the mark too. With Borat, the gag was watching people be confused by and try to adapt to his foreign character. With Bruno, the scenes are often more about watching people react with disgust or even violence to his homosexuality which is a far darker subject to laugh at.